U.S. Vogue‘s final offering for 2018 is the latest December issue to drop and, true to speculation, our forums were spot on with their prediction. Though Vogue is famous for using the same cover stars time and again — like this year’s cover girls Serena Williams, Alicia Vikander, Kendall Jenner, Rihanna, Beyoncé and Lady Gaga — this marks Emily Blunt’s first appearance. 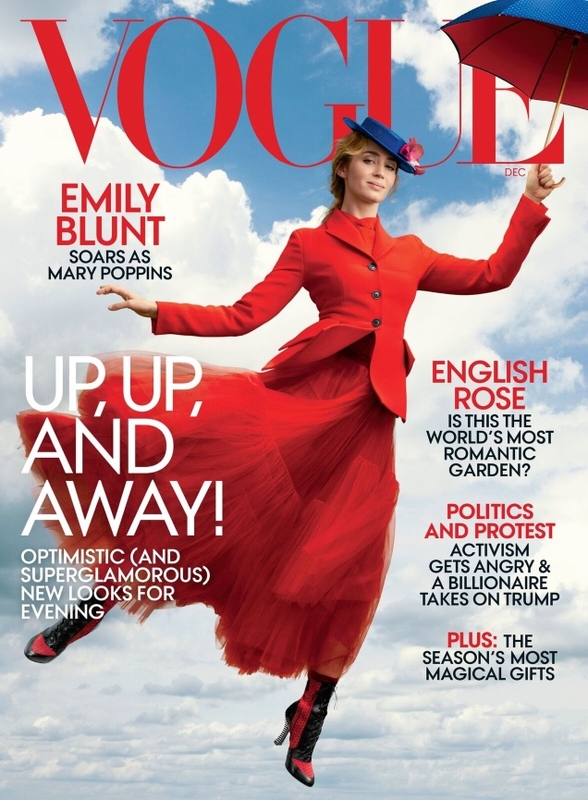 The Brit actress receives the full Vogue treatment, photographed by Annie Leibovitz and styled by Tabitha Simmons while in full Mary Poppins Returns character as she leaps across the skies in red Christian Dior. The cover became an instant hit with our forum members. “Oh I kind of love this! It feels a bit like the old Vanity Fair, but overall it’s lovely. It’s nice to see a cover with some charm and joy to it, even if it is very literal and a bit cheesy; so much fashion imagery is as dreary as anything these days, so anything other than blank stares and beige walls gets my vote. I love the bright red, it’s very festive,” said LastNight. “I personally love it, I always enjoy the character covers because they are a bit more fun and playful, than what we usually see from US Vogue,” admitted Blayne266. “OK, a shocker of a cover, but I LOVE this! It’s very much in the vein of the movie, and I like the red. I don’t really like the fact that she’s mid-air, a jump would’ve sufficed, but this is something new for US Vogue,” Benn98 chimed in. “I love the cover! It’s fun, dreamy and slightly theatrical which is missing from recent US Vogue’s December issue covers,” praised Rigida. “Finally, a dreamy and classic cover by American Vogue. Love the art direction and styling,” TZ001 complemented. Check out Emily’s cover feature and join the conversation here.